About Mahalaya : Mahalaya ushers in the aura of Durga Puja. The countdown for the Durga Puja begins much earlier, from the day of 'Ulto Rath'. It is only from the day of Mahalaya that the preparations for the Durga Puja reaches the final stage. 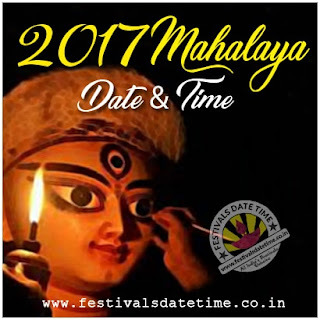 Mahalaya is an auspicious occasion observed seven days before the Durga Puja, and heralds the advent of Durga, the goddess of supreme power.. It's a kind of invocation or invitation to the mother goddess to descend on earth. This is done through the chanting of mantras. The day is being observed as Mahalaya, the day of invocation. In the dark night of amavasya (new moon), people pray to Goddess Durga to arrive in the earth to ward off all evils.